I want to try to make it clear why you can squeeze the front brake lever as quickly as 0.3 seconds without significantly increasing your risk of skidding the front tire even though it can take as long as 0.7 seconds to fully compress your shocks during aggressive braking. We will look closely at how a motorcycle behaves when achieving an aggressive (0.8g) deceleration rate as it comes to a stop from 60 mph. The diagram above shows (the red line) how much downforce (weight) is on the front tire over time given that the total weight is 800 lbs., the weight bias is 55% toward the rear, and a 0.5 weight transfer ratio (height of CG divided by length of wheelbase), and that maximum braking pressure (squeeze) occurs in 0.7 seconds and causes a maximum deceleration rate of 0.89g's. We see that before any deceleration actually occurs, there is a total of 360 lbs. of downforce on the front tire. We also see that after 0.7 seconds, there is a downforce of 716 lbs. on that tire. Now we look at the blue line. It represents the maximum braking force that the front tire can produce over time before it skids. This is calculated as 1.2 times the downforce. Though braking force (the straight black line) is shown as linearly increasing, that is a simplification of reality. It suggests that you squeeze harder in a linear fashion - which is approximately correct. The red and blue lines are curved, however, to demonstrate that weight transfer reaches the tire contact patch in a non-linear fashion. Notice that at no time does the braking force generated by the front tire even approach the blue line - skidding is not likely. Now let's look at what happens when we reach maximum deceleration rate with a faster squeeze time of 0.5 seconds. 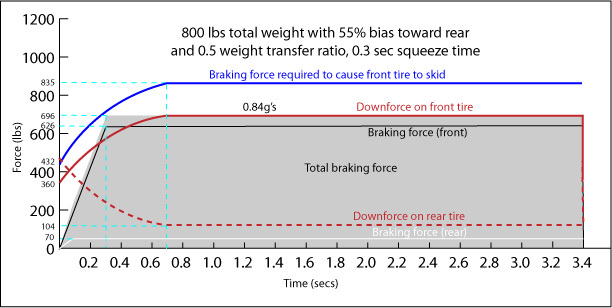 Note that for a brief time near when the maximum deceleration rate is achieved the braking force exceeds the weight on the front tire, but that it does not exceed the maximum force required to cause a skid. Finally, let's look at what happens when the squeeze time is as little as 0.3 seconds. This is not the full story, by any means, but it demonstrates the concepts that I've tried to convey here. A couple of important additional points should be made, however. So far, this discussion has presumed that all braking is done with the front brake. Obviously, a rider is well advised to use both brakes whenever doing a quick stop, because you need some anti-yaw force from the rear tire to help keep the rear-end of the bike tracking with the front, and because to the extent that you get any braking force from the rear tire, you decrease the braking force needed from the front tire. In terms of the diagrams above, the red and blue lines are not effected in any way when you use both brakes instead of just the front one, the gray area (total braking force) remains the same, but the black line which shows braking force, is broken into two different lines (black for front and white for rear brake) and the black line would be farther away from the red and blue lines - meaning, skidding would be much less likely. 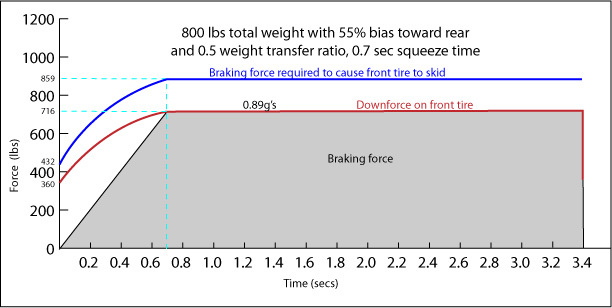 Shown below is an example where the front brake provides 90% of the braking force. Finally, as I mentioned earlier, the effect of shortening the wheelbase caused by compressing the front shocks is to make both the red and blue lines higher than shown. That, of course, also reduces the likelihood of skidding. Just to make sure we're all on the same page ... it's when the black line (not the gray area) crosses the blue line that the front tire skids. This is a concept discussion - the numbers are estimated and approximate. No attempt was made to estimate the effect of shortening the wheelbase. Copyright © 1992 - 2019 by The Master Strategy Group, all rights reserved.